I played hooky from my alterations the other day. The client is out of town right now, so……. For weeks now ( months, maybe?) I’ve been grousing about the apron that I usually wear. Yes, I wear an apron nearly every day. I cook, and don’t like the splatters that grace my clothes if I neglect to don one, and the convenience of a place to wipe my hands is the bonus. 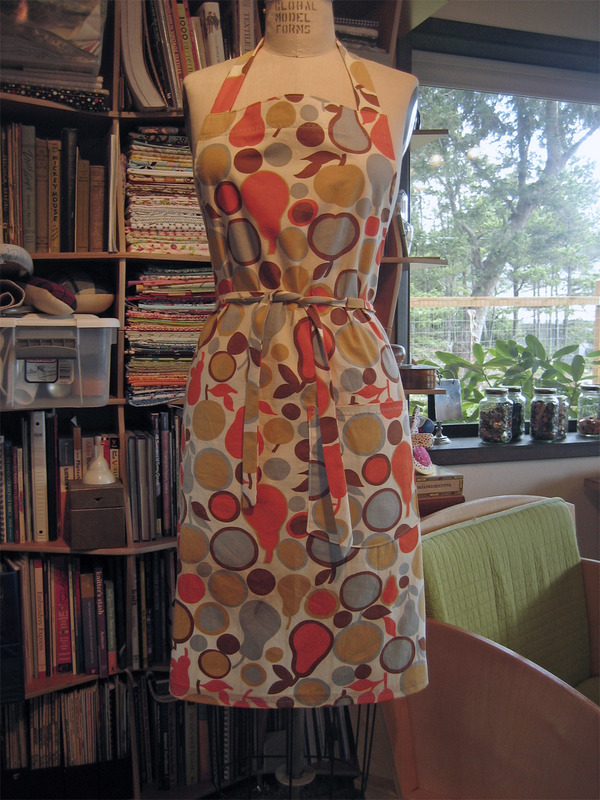 I’ve sold a few aprons in my etsy shop, but they are the half apron variety. Cute, though not the coverage that I want when I’m at the stove. So, off I go shopping. In my sewing room. 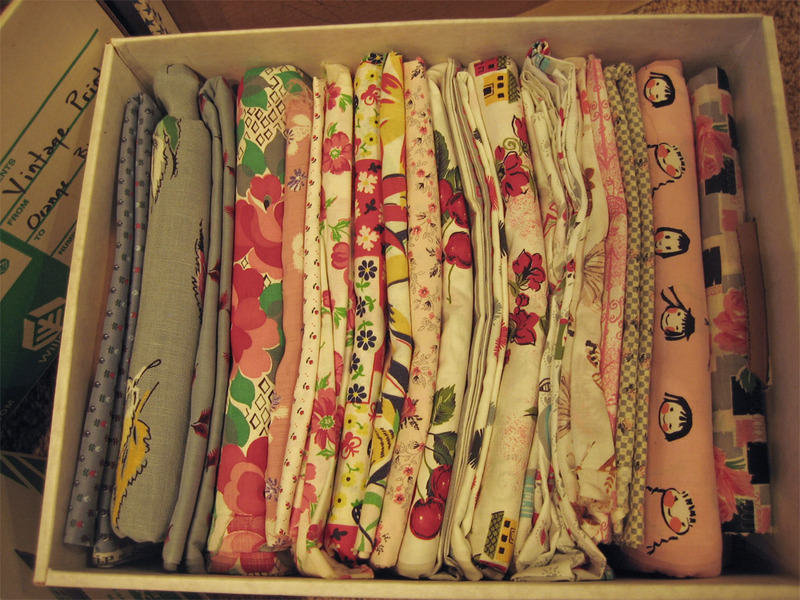 Surely there must be something in one of the boxes of vintage fabrics that I’ve been ‘saving’ for just the right thing. 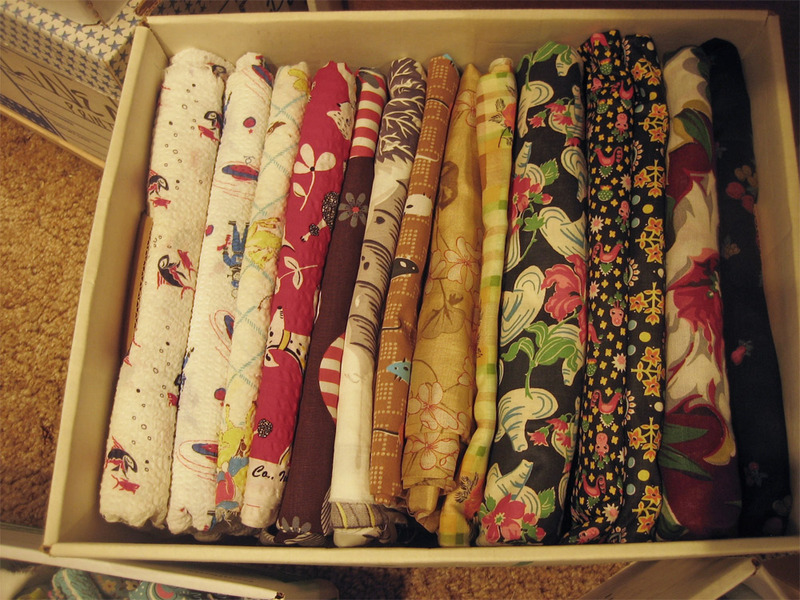 One of the things I collect is old cotton prints – lots of these are the 50’s era, 36″ width variety. If you want to make a dress, you’ll need several yards. 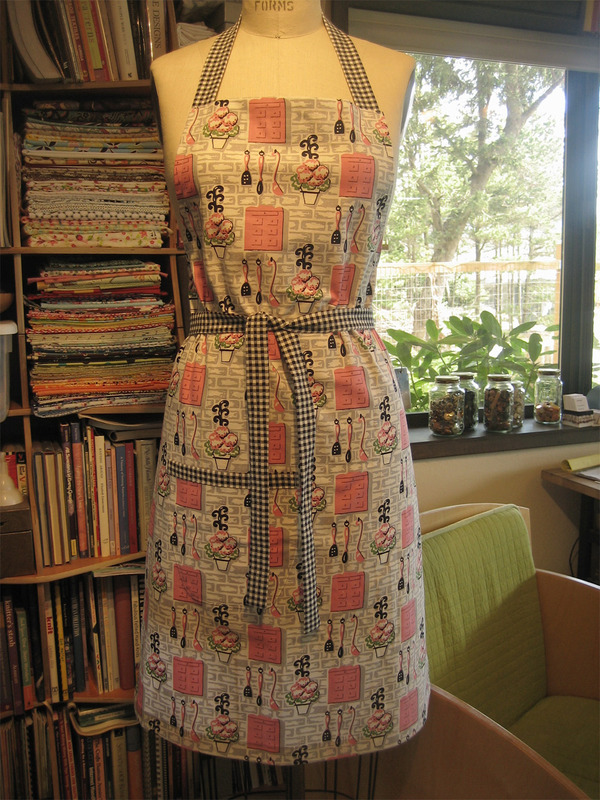 A 50’s full-skirted dress can easily take 7 or more yards using those narrow fabrics, so you have to get creative. Will it come from the “pinks and greys” box? The “greens and blues ” box? and, I had enough of this to make a second one to put in the shop. And the other was a shoe-in as I had just the perfect amount to eek out what I wanted:: I think both of these came from some estate or yard sale in the past few years. The best thing about looking at old fabrics is that each time I decide on something else that I want to make from a particular piece. Sometimes I’ll lay the pattern of choice in the box, then when I open it up again see if I still know what it was to be paired with. If not, then I put the pattern back in the cabinet. Other times, a piece begs me to sew it up right there and then. After the aprons, it seemed only logical to give the table a new cloth as well. I found this fabric in a box a couple weeks ago and decided that it would be better suited to go under my new (to me) dishes than shopping bags. Um, I guess I should have given it a final pressing. Cool, I love that second apron, the colours are brilliant! 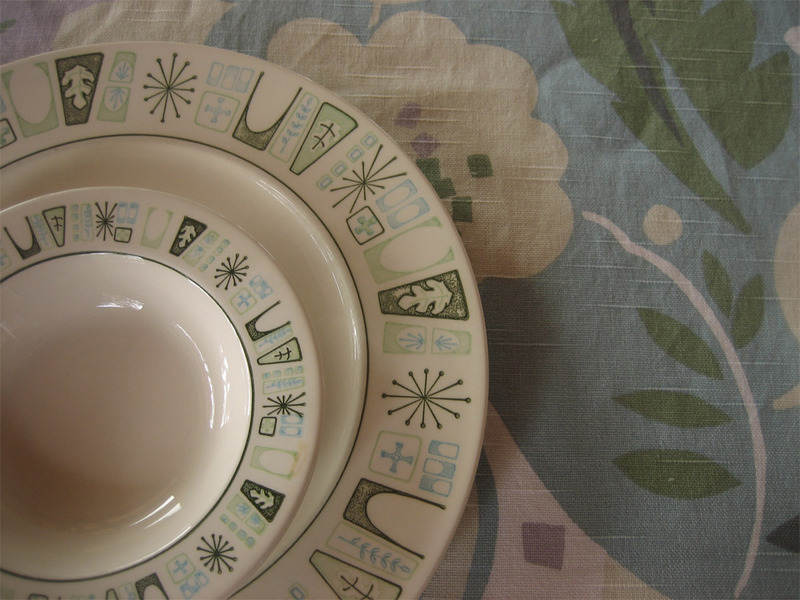 And that new table cloth looks perfect with your plates, look slike they were meant to be paired together! Thanks! The pic doesn’t begin to show how bright the orange is in that apron; it’s sort of trying to be neon in that funny 60’s way. Wow, wow, wow! Your fabric stash is so Awesome I can’t even tell you how awesome I think it is, and I would bet a shiny dollar that isn’t all of it! The choices you made for your aprons, perfect! That neato dinnerware with that table cloth, pressed or not…it’s like they were made for each other. I spent years working in a beautiful fabric store, and couldn’t resist the end of bolts which we got for a song. 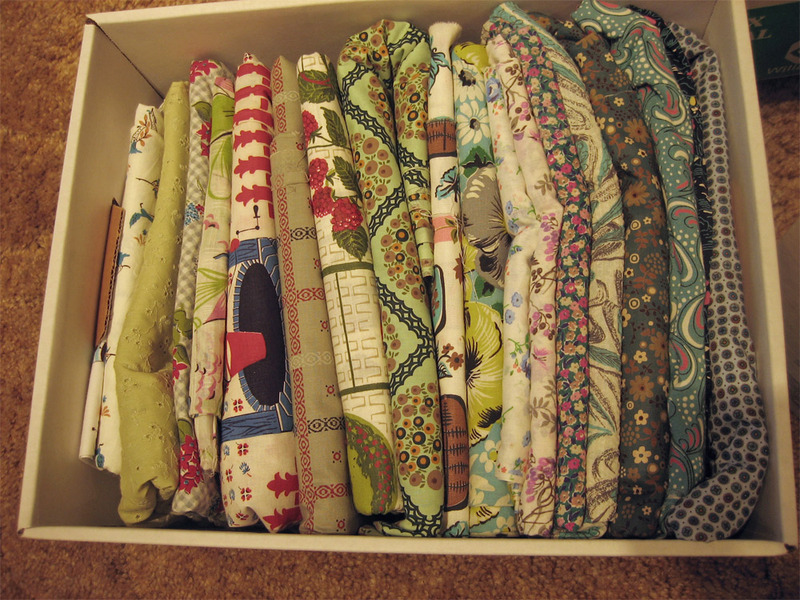 I moved here three and a half years ago with about 100 boxes of fabric, and have whittled it down by about a third. Only a portion of it is actually vintage though. And thanks for the nice comment about the aprons and tablecloth! Good looking aprons, Renée! I like the one with the pears, very stylish. I too love aprons and have lately been wearing the half apron you made for me.